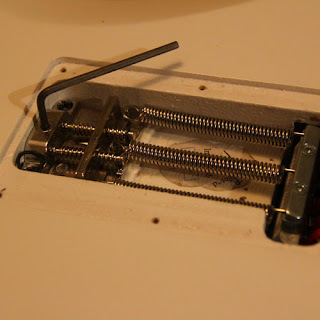 A couple of neat mods to floyd rose equipped guitars - Ibanez Edge Pro arm torque and Schaller SureClaw replacement for conventional spring claw. 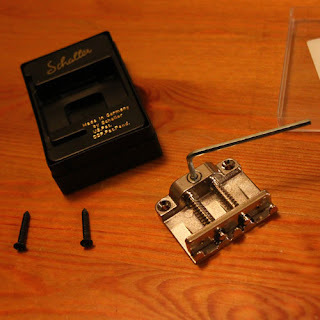 You might also like the article about tremolo stabilization tools. Ibanez Edge Pro arm torque This is a neat mod to Ibanez Edge Pro tremolo unit I find very useful. 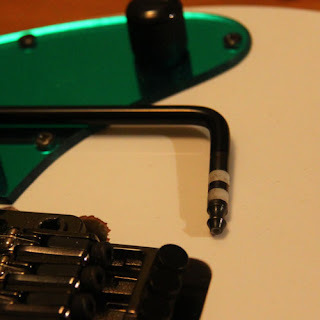 As we know the tremolo arm uses two bushings for arm torque which wear out very fast. And the time isn’t weeks or months, but hours or minutes, and the included extra bushings aren’t of great help here. So this is what we do to tighten the arm torque. 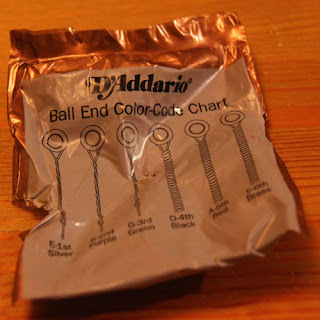 For me, I use D’Addario strings for many years and the cellophane (?) packaging helps here. 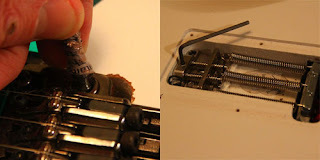 twist it clock-wise around the tip of the tremolo arm. More towards the bottom end. Hold it very tight. 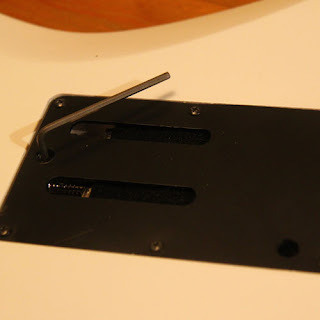 Then insert the trem arm into the baseplate also turning the arm clockwise. 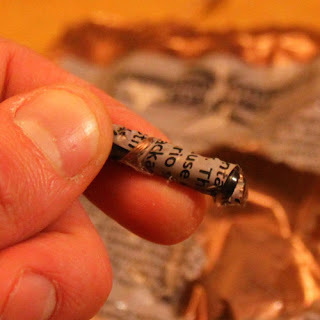 You need to keep the cellophane very tight around the tip as you sink it into the hole. And then you’re done. You’ll get the technique as you do that again and again. For me, this wrap works for months. Keeps the arm very tight, perfect for flutter, for example. The main reason for me is that I like having the arm fixed at the point that I want it to be (for easier grab), not just hang and roughly gravitate. And by the way. 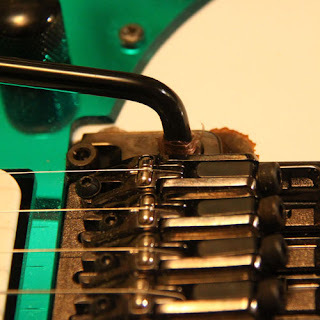 These pictures are Ibanez RG350 which originally had Edge III trem which had this arm torque control with the hex screw (very handy) like Gotoh units have but it is very cheap materials, wears out very quickly and you’ll need to change it to, say, Edge Pro, which is an excellent trem. BUT, be sure to change the Edge III trem posts to Edge Pro trem posts as well, because that is at least 80% impact on stability. 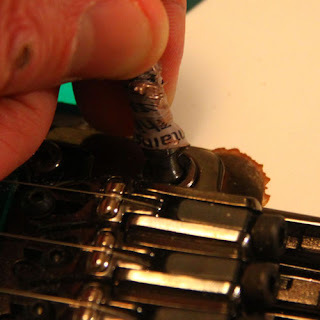 It will require body routing, so bring the axe to a trusted luthier but I really stress that changing Edge III to Edge Pro without changing trem posts might ruin your impression of the latter trem. 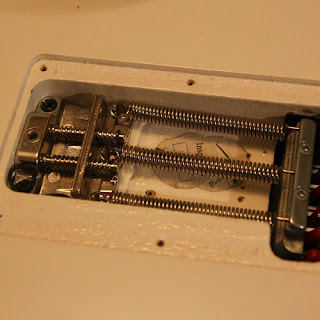 I’ve read a lot of forums that guy here and guy there is exchanging the trems but not a word about the trem posts. Just pay attention in this case. 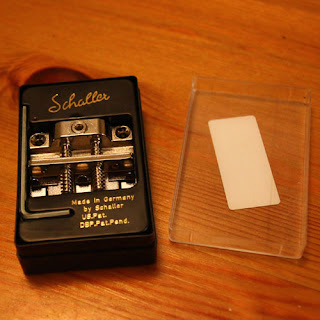 I am in no way connected with Schaller Electronic GmbH but this is a very handy little thing to maintain your floyd rose equipped guitar. 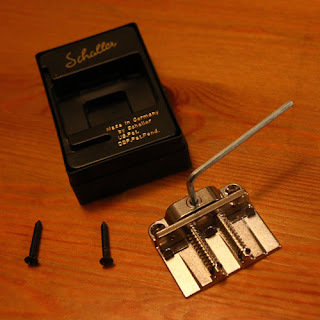 The convenience it gives is that you can tighten or loosen the springs with a hex screw. 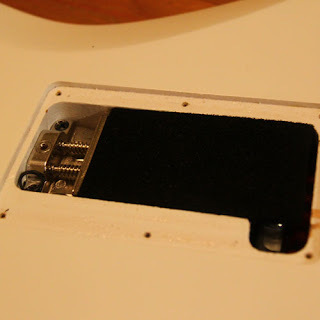 put the trem cavity plate on. Drill a circular hole in it and you’ve got access to your SureClaw without having the need to remove the plate to make any adjustments. Turn the screw clockwise to stretch the springs or counter-clockwise to loosen. This is how SureClaw looks far clockwise turned. Hope you find this useful. SureClaw retails at 25EUR. nice post! 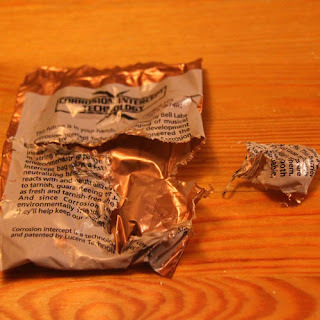 I used to use PTFE pipe sealing tape to stop rattles. I like that Sureclaw! Great tips mate thanks!